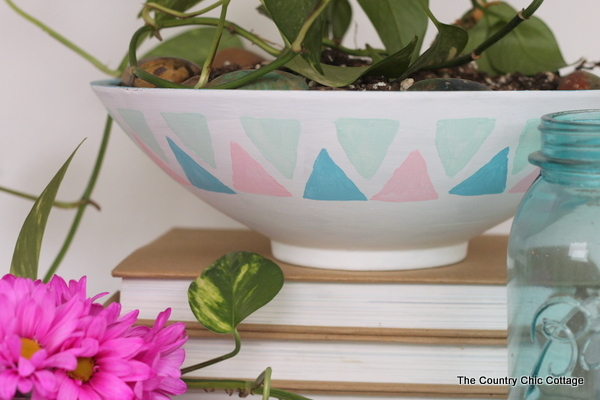 If you are looking for a unique idea for planting your spring and summer flowers, look no further then this painted bowl planter. 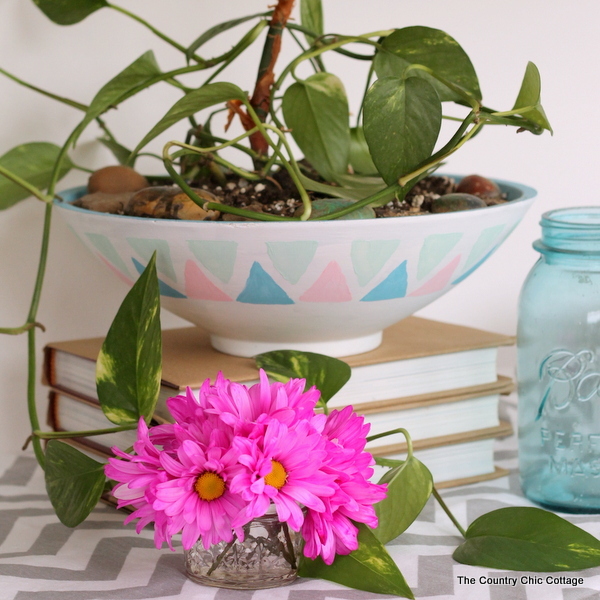 Find a bowl at the thrift store to transform into the fabulous creation. If you have some paint and a potato, you can make this craft. Did I just say potato? Oh yes I did! 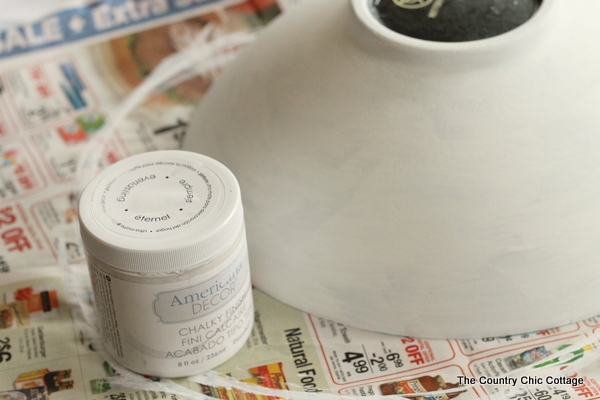 Start by painting the outside of your bowl with the Everlasting paint. 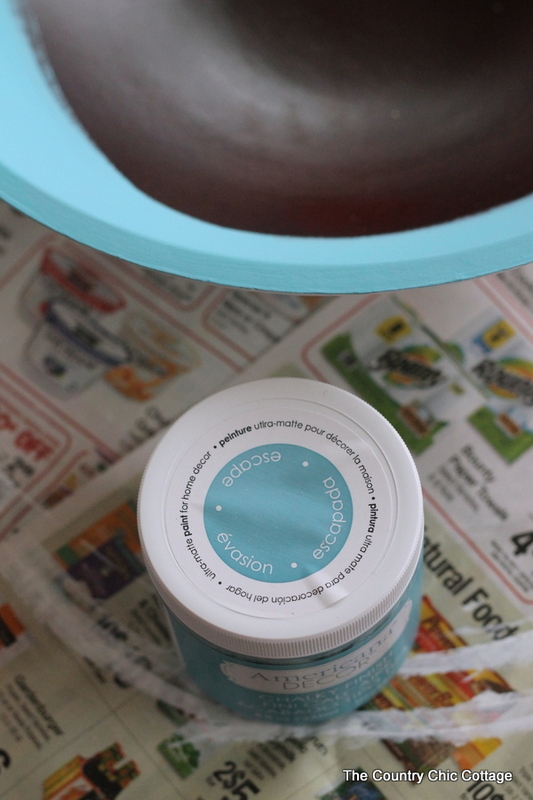 I used three coats of paint on the outer surface of the bowl to get complete coverage. 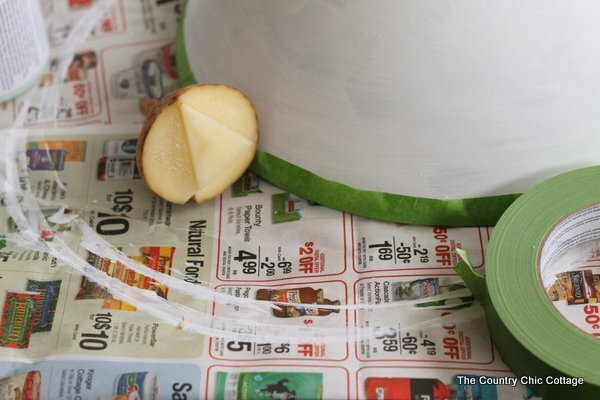 If the original color of your bowl is lighter it may take fewer coats. Remember to allow the chalky paint to dry for 2 hours before re-coating. Allow the last coat to dry completely before continuing. Turn the bowl over and use a contrasting color on the lip and the inside. NOTE: You do not have the paint the entire inside as it will be covered with dirt. I used Escape for my bowl and this only took 2 coats. You can use any colors you love on this project and that will match your home. Where does that potato come in? We are going old school with a potato stamp y’all. I wanted triangles on the outside of my bowl so I carved one in a potato with a knife as shown below. This of course is a temporary stamp and will need to be thrown out once the project is complete. I used a piece of painter’s tape around the bowl to help keep everything lined up and in approximately the same location as I was working around the edge. My first row of triangles is stamped with Refreshing. 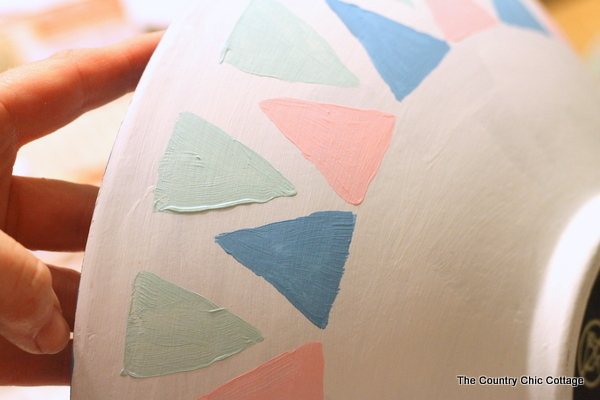 Just use a brush to add the paint to the triangle then press to the bowl surface. 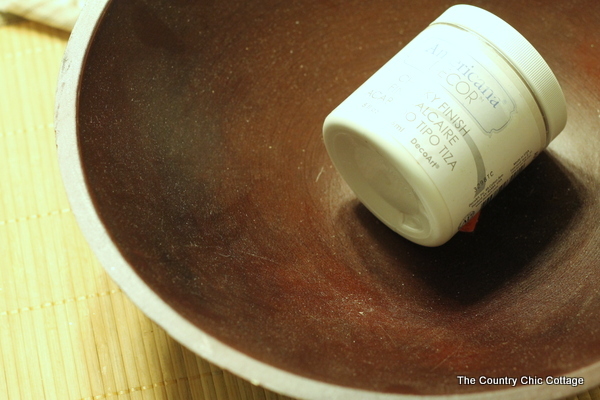 Use your brush to then touch up the triangle immediately on the bowl surface. Potato stamping is inconsistent and painting the shape in with your brush will give you more of a finished look. I then alternated a second row of triangles using Innocence and Escape. 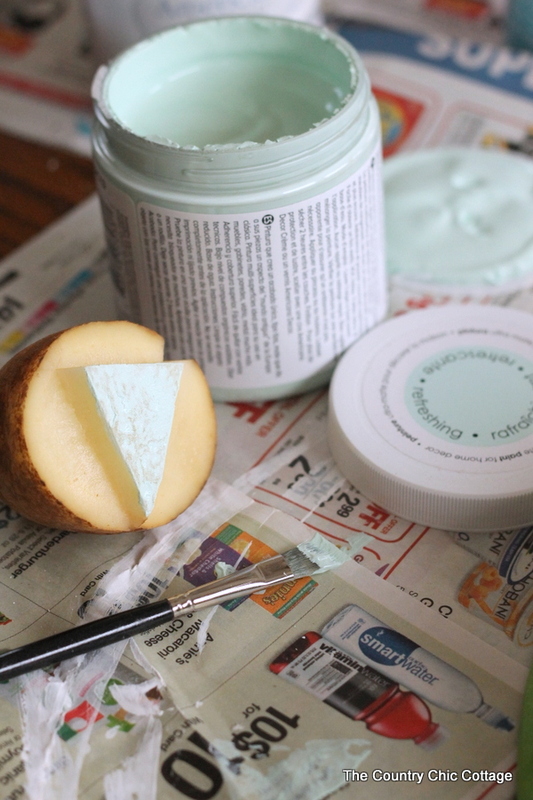 I used the same method of brushing paint onto my potato and stamping the rough shape onto the surface. Then I filled in each triangle with more paint and a brush immediately after stamping. Allow your project to dry completely. You can wax the finish with clear crème wax and buff if a shiny finish is desired. I left my surface matte. I am in love with this project and think my plants look great in it. It is amazing what a thrifted bowl can become once you grab a potato and some paint. 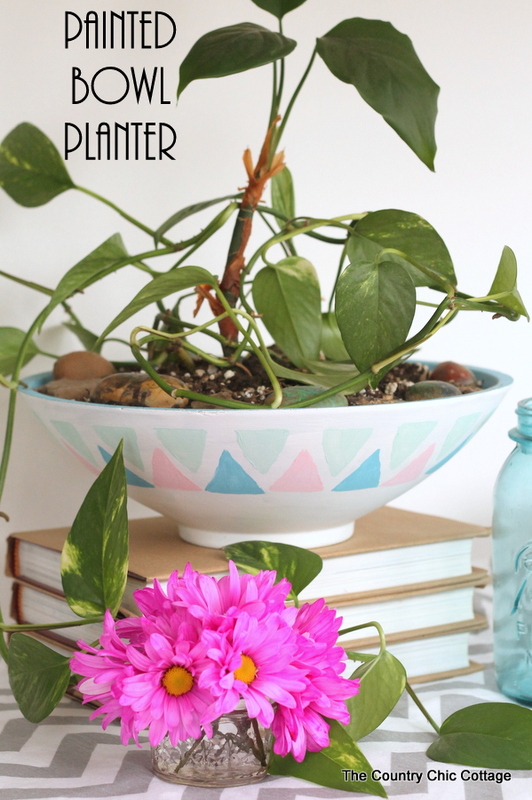 Be sure to make one or more of these painted bowl planters for your own home this season. Your plants will never look better!